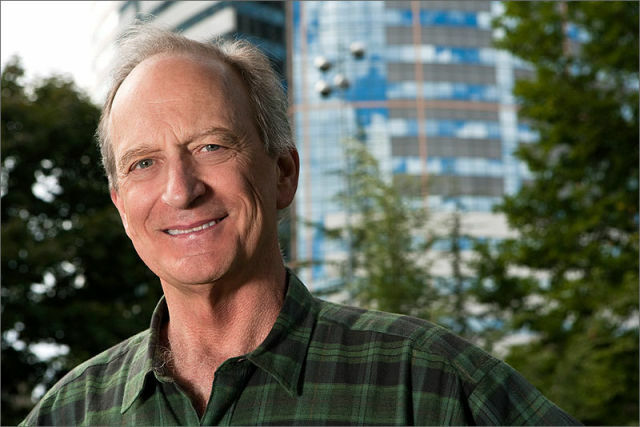 Denis Hayes will speak Monday, arguing that Portland, Seattle, and Vancouver can green the world. In 2013, Seattle’s Bullitt Foundation opened a new headquarters billed as the “most energy-efficient commercial building in the world.” Two years later, the $32-million, 50,000-square-foot building proved itself, generating 60 percent more power than it consumed. Denis Hayes was the principal national organizer of the first Earth Day in 1970 and took the event international in 1990. It is now the most widely observed secular holiday in the world. As board chair of the international Earth Day Network, Denis is gearing up for the 50th Earth Day anniversary in 2020. Over the years, Hayes has been special assistant to the Governor of Illinois for natural resources and the environment; senior fellow at the Worldwatch Institute; adjunct professor of engineering and human biology at Stanford University; Regents’ Professor at the University of California; and a Silicon Valley lawyer at the Cooley firm. Denis has been a visiting scholar at the Woodrow Wilson International Center for Scholars in Washington DC and at the Bellagio Center in Italy. During the Carter Administration, Hayes was the director of SERI — the nation’s National Renewable Energy Laboratory.